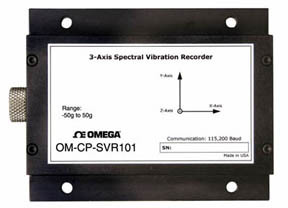 The OM-CP-SVR101 is a selfcontained data logger engineered to record accelerations for spectral analysis of vibration and peaks. This device is ideal for many applications including endurance testing, machinery failure detection, and vehicle vibration monitoring. This device records and time-tags 3-axis vibrations and peaks to provide a history of shock/vibration conditions. The device measures and computes real-time spectral data using an FFT (Fast Fourier Transform) from 0 to 128 Hertz. To make efficient use of memory, the OM-CP-SVR101 only takes data when the (user preset) trigger level is exceeded. The minimum sampling rate is 2 seconds and the device can display peak X, Y, and Z shock data, vector sum for data evaluated, up to 4 hours. Data is stored in non-volatile solid state memory. The OM-CP-SVR101 and the OM-CP Series Data Recorder Software makes data retrieval quick and easy. Simply connect the OM-CP-SVR101 to an empty COM port on the PC (via the OM-CP-IFC110 interface cable). Once offloaded to a PC, the information can be graphed, analyzed and presented using the OM-CP Series software or easily exported to a 3-D graph in Excel. Dimensions: 1.0 x 3.5 x 4.4"
참고: Operator’s manual, battery and USB interface cable included with the OM-CP-IFC200 Windows software (sold separately).